Today, when you order "Coin Purse Leather by Magic By Gosh", you'll instantly be emailed a Penguin Magic gift certificate. You can spend it on anything you like at Penguin, just like cash. Just complete your order as normal, and within seconds you'll get an email with your gift certificate. I love these little purses. I have 6 all together, always ready to go with special coins or sets like Jay Sankey's Holy Moly. The complete leather covering on the outside means that their isn't much exposed metal that can't get beat up and tarnished from hanging out in your pocket all day. Just be sure to buy 2. Trust me you will need them. this is the best coin purse ever! its not to big, therefore, it dosnt hold more then 7 coins max. but thats what i like about it. its small. the max number of coins i use is 6 so i dont need anything bigger, and it hides that clasp thing (i think thats what you call it) on the inside. perfect for gimmicked coins as well that you dont want to get scratched up with other coins. 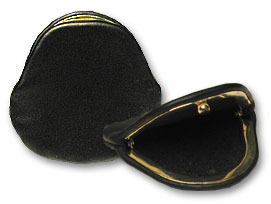 I have several coin purses, I ordered 2 a few weeks ago and was very happy with the price and quality. I just ordered 2 more. Beautiful! THIS IS ACTUALLY THE HIGHEST QUALITY AND I LOVE IT. I got this and thought that I had made a mistake in getting it. But then I put some coins in and realized just how good it was. It looks really nice without the frame not hanging out and it can hold a fair amount, I hold four right now and it seems just perfect. I do suggest that you get more than one if you do decide to get this though. Good quality and nice feel on the soft leather. Good price. My only problem is that you need to open it with your nails, and mine is pretty stuck. These coin purses were unavailable for a while. It seems that for a couple of years at least, they were out of stock everywhere. Now they’ve started showing up again and that’s great; but the quality isn’t quite on par with what they used to be. Don’t get me wrong, for the money, they’re still a decent coin purse. But the construction around the frame doesn’t seem to be ast sturdy and the clasp is both harder to open and doesn’t hold as well when compared to previous releases of the same purse from the same company, (Magic by Gosh). I don’t know how that’s possible - harder to open, but a less secure hold on the clasp? Weird combination. And it wasn’t just one bad one. I ordered five of them and they all have the same issues. Maybe things will get better, (or worse), with extended use. Only time will tell. But for the price, it’s better to have these purses than not have them. Just know that if you have some from years ago, you’re likely to notice - and be disappointed with - a slight dip in quality from what you have now. OK, $5 is not a high price, but this purse just looks and feels cheap. Is it REALLY leather? If so, it doesn't look like it. In all honesty I nearly threw it out with the packing material thinking it was a bit of rubbish. It's extremely small too. Not my best buy from Penguin.